On Monday January 28, Spanish DJ/producer, Wally Lopez, releases a remix package of his track, ‘You Can’t Stop The Beat’ on EMI Music, with mixes from Jasper Clash, DJ Dero, Albert Neve and Walker Barnard. The track is currently circulating the airwaves on Spanish radio stations, with its video receiving more than 250,000 views on YouTube. 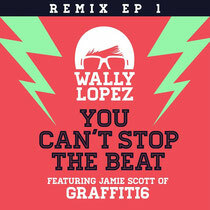 ‘You Can’t Stop The Beat’ is the latest single by Wally Lopez, featuring the collaboration of Jamie Scott, singer and writer of Graffiti6, a two-piece band from London that is reaping great success with debut album ‘Colours’ and single 'Free', a radio hit in the United States and Europe. This collaboration is the single which follows ‘Keep Running The Melody’ (feat. Kreesha Turner), his previous single which became a hit across dance radio shows through Spain, with the subsequent The Japanese Popstars remix taking it up another level. Check it out below.